As mentioned previously, Betty Howell Traver provided us with an amazing photo of Mary Johnson (1786 - 1856). 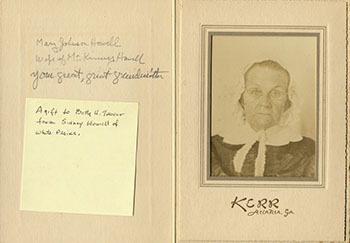 Mary was Betty's 2x Great Grandmother, and Henry Howell's Great Grandmother. When looking at this photo you realize that Mary's parents lived through the American Revolution, and that inevitably makes you ask "Is it really possible to have a photo of someone born in 1786? ", and "When was photography actually invented?"